During week 32, your baby is continuing to grow and develop, and you may be wondering how big he will end up being. Your weight gain may offer a clue, but this isn't the only way to predict your baby's weight at birth. At more than 16-inches long and 3.75 pounds, your little one is still growing quickly. With only about eight weeks to go before delivery day, your baby's big job right now is to build fat stores and finish developing. He is practicing breathing, but since there isn't any air inside your uterus, your baby is breathing amniotic fluid. You little one's lungs are still developing, and are maturing weekly. After 32 weeks, they are more compatable with life outside the womb. Your baby has begun using his intestines to absorb nutrients, an important developmental step. One day soon, he will be gaining nutrients from breast milk or formula. Although fingernails started forming weeks ago, your little one is now growing toenails. According to the American Pregnancy Association, your uterus has now grown so much that your doctor may be able to feel it about five inches above your navel. You're still gaining weight at a rate of about a pound or two per week, and some of that will be from increased blood volume. Over the course of your pregnancy, the amount of blood in your body has increased by 40% or 50%. Since your uterus is so much larger, it may be pressing on your diaphragm. This can cause discomfort in the form of heartburn, but it also may make you feel short of breath. Some shortness of breath is normal at this point in pregnancy. Try to take it easy if you find you're having trouble, but if you feel extremely dizzy, can't catch your breath at all, or are noticing other alarming symptoms, contact your healthcare provider right away. Many pregnant women who've gained more than the recommended 25-35 pounds fear they are destined to deliver larger-than-average babies. According to an article in the New York Times, only about 40% of women gain the recommended amount of weight. Most gain more weight than is needed to produce a healthy baby, and that weight gain may actually pre-program the child to be prone to obesity later in life. In addition, gaining too much weight actually doubles the risk of having a baby larger than nine pounds at birth. If you're curious about your baby's size, remember that genetics also plays a small role in birth weight. If you were a large baby, then your baby may be heavier than normal. Women who were overweight prior to becoming pregnant also have a greater chance of delivering larger babies. Your healthcare provider may be able to provide an estimate of your baby's weight by measuring the height of your fundus and palpating your abdomen. It's also possible to gauge your baby's size via an ultrasound. However, both of these methods may be off by as much as one pound. Now that you're 32 weeks pregnant, your healthcare provider has probably increased your prenatal visits to every two weeks. 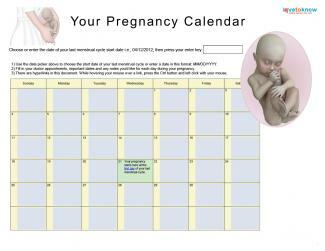 This schedule will continue until you reach week 36 when you'll begin seeing your doctor or midwife on a weekly basis.